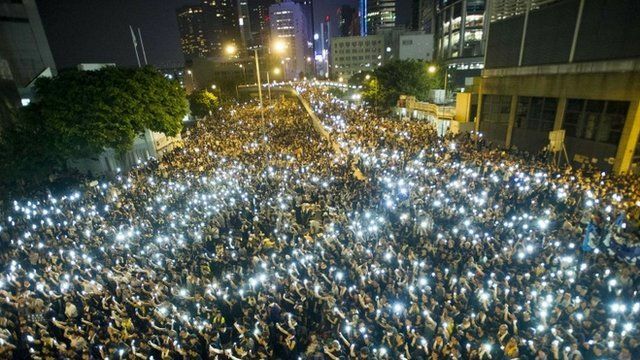 Hong Kong protesters defy warnings Jump to media player Tens of thousands of pro-democracy protestors are still occupying central Hong Kong despite police using pepper spray and tear gas to end the demonstrations. On the front line of Hong Kong protests Jump to media player Hong Kong police have used tear gas to disperse thousands of pro-democracy protesters near the government complex, after a week of escalating tensions. HK Occupy Central 'illegal' - China Jump to media player China brands the Hong Kong Occupy Central protest illegal and warns the world not to "interfere in internal affairs", as the White House urges authorities to show restraint. Tens of thousands of pro-democracy protesters are still occupying central Hong Kong, paralysing parts of the city. The police have defended their use of pepper spray and tear gas on Sunday and called for an end to the mass demonstrations. The protesters are angry at Beijing's plans to vet candidates for Hong Kong's 2017 leadership elections and want free elections for the post of chief executive. Carrie Gracie reports from Hong Kong.